We hope you'll join us in Orlando! 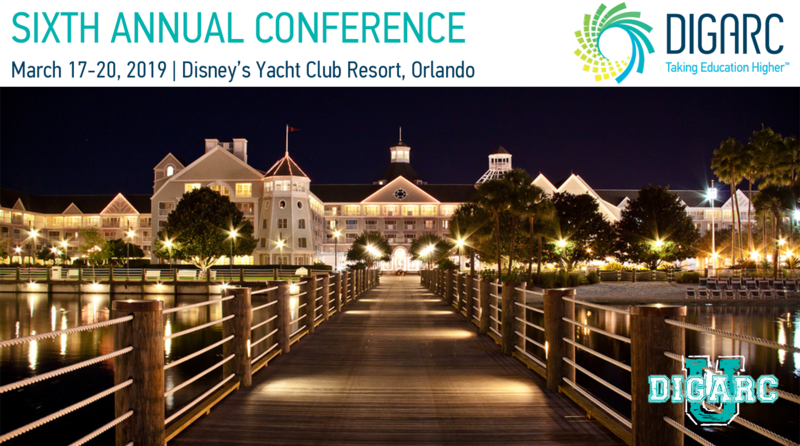 Join your peers and DIGARC experts in Orlando for the 6th Annual DigarcU User Conference! Network with more than 200 fellow users and spend one-on-one time with DIGARC staff during engaging sessions, user certifications, peer presentations, and an expert-led technical track. You'll get an exclusive look at the future of Acalog, Curriculog and SECTION along with a few surprises. You don't want to miss this event! Deadline for conference registration is Feb. 20, 2019. The fee for Beginner or Advanced Acalog or Curriculog certification is $150 each. Pre-registration and previous Basic Acalog or Curriculog Certification status required for Advanced Certifications. If you have any questions or would like additional information, please email us at conference@digarc.com. We look forward to seeing you there! Register today for the 6th Annual DigarcU User Conference. Need to make a case for attending? Just download the 2019 DigarcU Justification Template, customize it with the appropriate data, and submit it to your supervisor. To keep our conference affordable, we've negotiated a substantially reduced rate of $259/night at Disney's Yacht Club Resort, Orlando. To book your hotel stay, please navigate to the hotel reservation site or call 1-407-939-4686.